Academy volunteers are delivering a series of presentations at the NAIC Spring 2019 National Meeting in Orlando, Fla., addressing a variety of life, health, casualty, and professionalism topics. Linda Lankowski, vice chairperson of the Academy’s Life Practice Council (LPC), discussed the LPC’s concerns with the NAIC moving in a direction that would deviate from a principle-based approach for life insurance, and more toward a prescribed approach, as outlined in an Academy letter to LATF. Chris Whitney, presenting on behalf of the Academy’s Life Reserves Work Group, discussed VM-20 and Clearly Defined Hedging Strategy requirements, including an amendment proposal form that was submitted to LATF. Donna Claire gave an update on behalf of the Principle-Based Reserves (PBR) Governance Work Group. 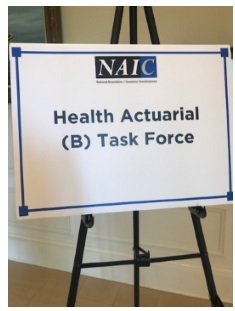 Barb Klever, chairperson of the Individual and Small Group Markets Committee, presented updates to the NAIC’s Health Actuarial Task Force (HATF) on the Academy’s Health Practice Council activities. Academy professionalism presentations—which will continue into the weekend, along with casualty presentations—included Friday presentations to HATF and LATF by Academy Past President Mary D. Miller, Actuarial Standards Board (ASB) Chairperson Kathy Riley, and Actuarial Board for Counseling and Discipline member Godfrey Perrott. Join us in April for the Academy’s first professionalism webinar of 2019, “Promoting Ethical Decision-making: Rules, the Human Brain, and Cognitive Biases.” The webinar, which will be held on Thursday, April 18, from noon to 1:30 p.m. EDT, will feature an engaging discussion with a professor of business law and ethics who focuses on the fundamentals of behavioral decision-making and cognitive biases and how they affect judgment. Continuing education credit will be available. Register today. Multiemployer Plans Committee Vice Chairperson Christian Benjaminson gave a presentation to the Actuaries Club of Philadelphia Tuesday in Philadelphia. He provided historical background and context to the financial challenges facing distressed multiemployer pension plans and discussed recent activities in Congress, including Academy testimony at two congressional hearings, aimed at addressing their ongoing financial health and the financial health of the Pension Benefit Guaranty Corporation’s (PBGC) multiemployer plans program. Two Academy-sponsored events are set to begin. The sold-out 2019 PBR Boot Camp begins Monday morning in Orlando, Fla., and continues through Wednesday. Attendees will hear from those who have been at the forefront of the implementation of PBR for life insurance. In Washington, D.C., the Enrolled Actuaries Meeting—jointly sponsored by the Academy and the Conference of Consulting Actuaries—begins Sunday, and also runs through Wednesday. Academy President Shawna Ackerman will deliver opening remarks Monday, and numerous Academy work products will be featured at meeting presentations. The quarterly ASB Boxscore includes the ASB’s approval of a fourth exposure draft of a proposed Modeling actuarial standard of practice (ASOP) and an exposure draft of a revision to ASOP No. 22; the ASB’s recently released annual report; and an overview of ASB projects. The PBR Review Procedures Work Group released an exposure draft of a public policy practice note on common practices for financial solvency examinations, including considerations for PBR. Comments are due July 1. Read the Academy alert. The Medicare Subcommittee sent a comment letter to the Department of Health and Human Services’ Office of the Inspector General regarding a proposed rule on safe harbor protection for rebates involving prescription pharmaceuticals and on the creation of new safe harbor protections. The Multiemployer Plans Committee submitted comments to the PBGC regarding simplified methods and other aspects of computing withdrawal liability under The Multiemployer Pension Reform Act of 2014.